Now before we get started, just note that this is a #sponsoredpost… moving on! *Insert some random colour here* is the NEW black! Well in my case, blue is MY black. Blue is one of the most versatile and non-polarising colours out there. The vibe you send can completely differ if you're wearing a bright blue vs. navy which makes blue an all-year round colour and a staple in my wardrobe. So having a bit of fun gallivanting through the Westfield website for dresses, I was very easily able to hand pick a few of my favourite blue dresses (colour filtering is a god-send and more Aussie websites should be doing this!). I dig it cos it’s blue. I am short, so looking for dresses that are no longer than mid-knee length. Some of these dresses may look a tad short in the images, but I’m going to blame those poor unfortunate souls otherwise known as leggy models. For us mere mortals, this means the hem is more likely to sit a bit lower and protect our ‘modesty. I am a tight arse, which means I am a mega-advocate of picking pieces which are trans-seasonal and will last longer in my clothing repertoire than a certain Kardashian’s marriage. I look for pieces that decrease my cost per wear which simply means the more times you wear it, the more bang for your buck. Sydney weather is unpredictable at times. So for colder days you can always chuck on a pair of tights. Love this, the back is almost just as gorgeous as the front! 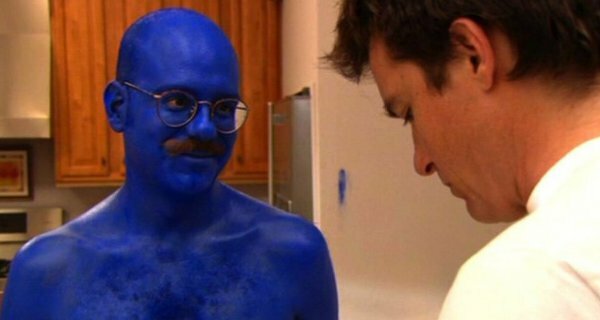 A wise man once said, “I just blue myself” now you can be just like Tobias Fünke (Arrested Development) and do the same thing! Hop at it! This is a sponsored post. Given the option to cover dresses (easy! ), I was given freedom to create my own post/theme, handpick the pieces and insert my own bad taste.